River Guides of Panbang, Bhutan’s first ever community-based rafting company based in Panbang, Zhemgang is proving to be a successful ecotourism venture. The company was started by a 10 member local youth group with financial support from the Bhutan Foundation. Panbang is a remote community but it lies in the Lower Kheng region, which is blessed with rich biodiversity. It is home to the country’s largest river basins- Mandgechhu and Drangmechhu basins. It also has the Royal Manas National Park in its close vicinity. With an area of 1,075 square kilometres, the park, one of the oldest in the country, is home to numerous endangered bird, animal and plant species. Given these attributes, the members of the River Guides of Bhutan saw potentials in Panbang to become an eco-tourism hotspot. That’s how the River Guides of Bhutan came into being. The company provides rafting service to both locals and tourists. The firm says all their river guides received professional training in rafting from Nepal. The training was funded by the Tourism Council of Bhutan. 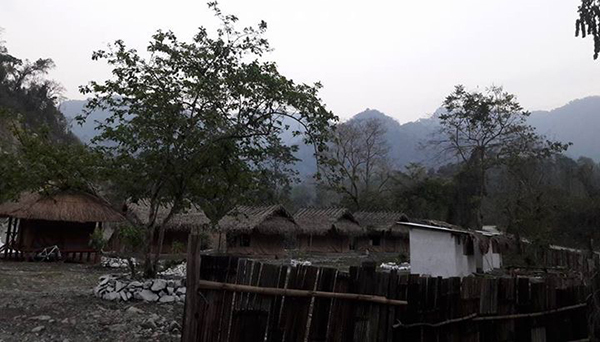 Besides rafting trips, the River Guides of Panbang also runs the Jungle Camp, an eco-lodge camp, which opened early last year. 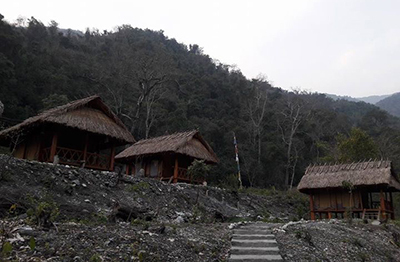 Located near Marangdut tributary of Drangmechhu, the Jungle Camp houses eight tented camps. A beautiful and distinctive feature of the camp is the thatched roofs. The River Guides of Bhutan earned an income of about Nu 500,000 last year. The company says it donates 5 percent of its earnings to the Royal Manas National Park and 20 percent to the Panbang community. The company is planning to expand its services in the future. They are eyeing bird watching, biking and trekking.